The 2013 Ford Focus ST is the first global performance vehicle in Ford Motor Company’s One Ford plan and today, FoMoCo announced that the high performance Focus ST will carry a starting price of just $24,495 (including a destination fee of $795) - and you can build/price your dream Focus ST on the Ford vehicle website right now. The 2013 Ford Focus ST technically carries a starting price of $23,700 and that includes the 2.0L 4-cylinder engine, churning out 252 horsepower and 270lb-ft of torque from the first high performance application of Ford’s EcoBoost technology in the US. This power is channeled to the front wheels exclusively via a 6-speed manual transmission and a sport tuned electric power assist steering (EPAS) system has been designed to cut down on the amount of torque steer under hard acceleration - allowing the driver to make the most of their high performance Ford 5-door Focus ST. The Focus ST also sports unique race ready suspension and performance braking system to make sure that the hot hatch handles and stops every bit as well as it accelerates. Those who want a little more out of their 2013 Ford Focus ST can opt for equipment group ST2, which adds a Sony audio system controlled by an 8” touch screen and featuring both satellite and HD radio, dual zone climate control and a set of sporty Recaro race seats trimmed partially in leather. 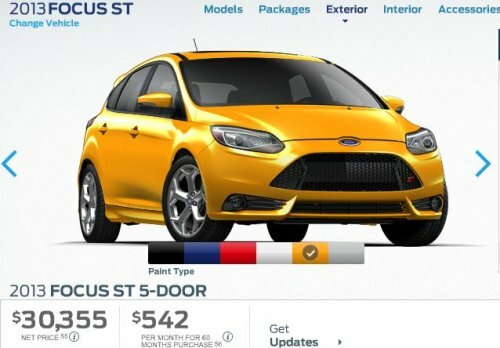 This package will add $2,385 to the final price of the Focus ST; although Ford states that this package offers the buyer savings of $120 over ordering those features individually. I actually prefer the two-tone partial leather Recaro seats - as they offer a sportier look than the all black seats…in my opinion. If you want even more amenities from the 2013 Focus ST, equipment group ST3 starts with the goodies from group ST2 but the partial leather Recaro seats are replaced by full leather seats with heating elements, HID headlights, cornering lamps, LED signature lighting and ambient lighting, heated exterior mirrors, navigation, and an overhead storage console. This package adds $4,435 to the total price but in ordering this package - buyers reportedly save $405 from ordering the items on their own. However, very few of these items add any go-fast qualities so those who are looking to go fast and do it cheap - the base Focus ST might just be ideal. The 2013 Ford Focus ST is available in six different colors (Tuxedo Black, Performance Blue, Race Red, Oxford White, Tangerine Scream, Ingot Silver) with all but the Tangerine Scream coming as part of the standard package. Tangerine Scream will cost buyers an extra $495 but we think that it is well worth the price - as this unique metallic orange is a great looking color in the bright sunlight. Once you have equipped the Focus ST with the ST3 equipment group, the only exterior option is the $895 power moon roof. Inside, if the ST3 package is picked there are really no options to select and if you are going for the base Focus ST, there are no options that you can pick online (right now) that can be added without adding an equipment group. In short, if you want any goodies, it is best to go with the ST2 or ST3 equipment group packages. There is, of course, the $35 engine heater available for all 2013 Focus ST models. If you go through the 2013 Ford Focus ST configuration page and check every option - the final price is $30,355 (as shown above on the right). That includes the base price of $23,700, the $795 destination fee, $4,435 for the ST3 equipment group, $495 for the Tangerine Scream exterior paint, $895 for the power moon roof and $35 for the engine block heater. However, my idea 2013 Focus ST would feature the ST2 equipment group, the moon roof, Tangerine Scream paint, and the Sync system with MyFord Touch - for a final price of $29,065. If Ford offered the two-tone Recaro seats with the ST3 package I would just go for the loaded version and face he minimal upcharge of just over a grand but right now…I love those multicolored seats too much to go with the ST3 group. Click here to head over to the Ford Vehicles website to build and price your own 2013 Ford Focus ST. The fact that Ford once again does not have a clue about what people want is evidenced by the lack of the two-tone all leather recaro seat option. Even worse; when I go for the ST2 option, I loose out on the HID lights. For me that just killed the deal!